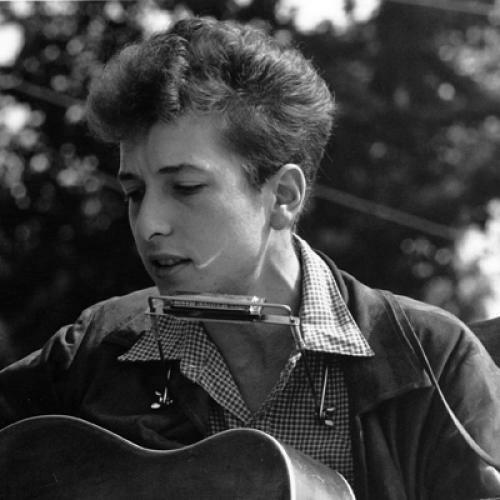 The marvel of Dylan’s subsequent work (made without Hammond’s involvement) gave Hammond’s early advocacy the aura of prescience; Dylan’s first biographers, Robert Shelton and Bob Spitz, established the audition story as a quasi-mystical moment in Dylan history. When Bruce Springsteen read the tale in Spitz’s book, he imagined himself duplicating it—and, with the benefit of both talent and a style that suggested a young Dylan, Springsteen succeeded, making his own way into Hammond’s office on May 2, 1972—forty years ago next week. Over the decades since then, Springsteen has memorialized the scene in concerts with an air of humility and gratitude that belies the self-congratulation inherent in romanticizing one’s own anointment. Aretha Franklin, in a vintage TV interview preserved on Youtube, remembered her own John Hammond audition with cheeky good humor. Much as Springsteen impressed Hammond by presenting a twist on Dylan, Franklin tried to get Hammond to think of her as a female Sam Cooke.